Are you ashamed of your missing teeth? Do you find yourself avoiding pictures, or even social situations, because you’re ashamed of the state of your mouth? The time for hiding is over! You should consider implant dentistry from Dr. King Scott’s office. Dental implants are one of the best ways to replace missing teeth. There are two different kinds, dental implants and implant-retained dentures. Dental implants are best for replacing one or a few missing teeth, while implant-retained dentures work best for a few missing teeth all in a row. Both types of implants will require a small surgery to attach the implant posts to your jaw. Once these have healed, Dr. Scott will attach either the individual replacement teeth or the denture. 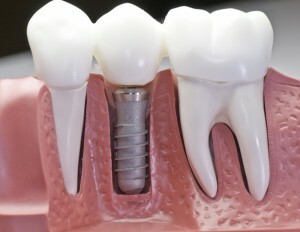 Since they’re attached to the bone, these implants will function just like your natural teeth. If you have missing teeth you’d like replaced, please give our office a call! You’ll start by having a consultation with Dr. Scott, where he’ll go over your options and see if you’re a good candidate for dental implants. Then, he’ll create a treatment plan for you and you’ll be on your way to having a mouth full of healthy teeth once again! Call us today to schedule your appointment or to discuss implant dentistry in more detail. Our West Monroe, LA office has provided quality dental care to patients from Monroe, Ruston, Rayville, Farmerville, Columbia, South Arkansas, and greater North Louisiana for three decades.